Are you a BlackBerry mobile phone owner who buys a new iPhone 7 and want to transfer all of their present photos and pictures from the old BlackBerry phone to their new iPhone 7? But now, you have troubles in syncing the photos between the two mobile phones. Well, don't worry! In this article, you can find all the solutions of whatever the trouble you have met. 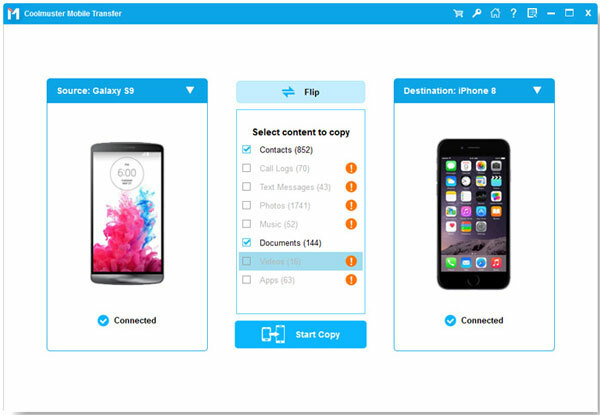 You can make it easily by using a professional phone to phone data transferring program called Phone Transfer, which is fully capable of transferring not only photos, but also text messages, apps, music, videos, contacts and more from one phone or tablet to another, which is in Android, iOS and Symbian systems. The software makes it hassle-free to complete the pictures transfer between iPhone 7/7 Plus/6S/6/5S/5 and BlackBerry. Free download the right version of the Phone Transfer via the following buttons, Then, go through the following instructions to switch pictures and photos between BlackBerry and iPhone by using the recommended Phone Transfer..
How to Transfer Photos between Blackberry and iPhone? To get started, launch the Phone Transfer on your computer and you can see its primary interface as following. Three different options are displayed on the interface. Just choose the first "Phone to Phone Transfer". Use two USB cables to connect your iPhone and BlackBerry phone with the computer. Once they’re connected, Phone Transfer will detect and show them in the interface. All the transferable file types are listed on the top. If you just want to transfer photos, you should only open "Photos" option, preview and mark the images you want. Finally, click the transferring icon to start the pictures transfer from your iPhone to BlackBerry, or from BlackBerry to iPhone.